The neighborhood of Central Pebble Beach is geographically the largest of the Pebble Beach neighborhoods and encompasses both Spyglass and Poppy Hills Golf Courses, and acres of the Del Monte Forest. The boundaries of Central Pebble Beach are Morse Gate to the north, and to the south its boundary is the Pebble Beach Golf Course along the 17 mile drive. At the southern tip you will find the gate to Carmel-by-the-Sea. To the east the neighborhood is bordered by the two-lane Hwy 68, and the west boundary is 17 Mile drive, with inspiring views of Bird Rock and Seal Rock. The Central Pebble Beach real estate neighborhood is a lushly diverse and vast area. Moving westward through Del Monte Forest with its abundant hiking trails, and towering pine and cypress you experience sweeping vistas. 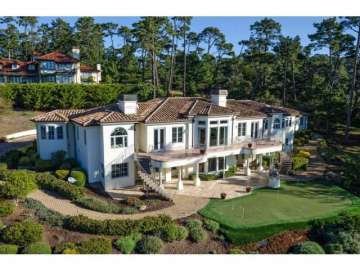 Continuing your journey to the coast, you reach Poppy Hills then Spyglass golf course, then the famed 17 mile drive with its stunning ocean view estates. From green fairway views to panoramic views of Pt. Lobos and Stillwater Cove, homes in this central Pebble Beach location offer infinite combinations of land and sea, all uniquely beautiful. Click here to preview all Pebble Beach homes for sale in the Central Pebble Beach neighborhood. For all available Pebble Beach real estate, click here. In 2018, 22 homes sold in this neighborhood. The most expensive home to sell was an Ocean view Pebble Beach estate with 3 bedrooms, 3.5 bathrooms, 7,388 SqFt of living space on a 1.65 acre lot and sold for 9.8 million. The least expensive home to sell, sold for 1.2 million for a single-level Ranch style home with 3 bedrooms, 3 bathrooms, 1,742 SqFt of living space on a 9,300 SqFt lot with views of Spyglass Golf Course fairways. In 2017 21 homes sold in this neighborhood. The most expensive home sold for 7.5 million for a 4 bedroom, 6.5 bathroom, Mediterranean residence with 8,530 SqFt of living space on 1 acre with Ocean and fairway views. The least expensive home sold for 1.2 million for a 3 bedroom, 3 bathroom, single-level home, 2,288 SqFt of living space on a 20,275 SqFt lot, complete with an Au Pair’s unit. 29 homes sold in this neighborhood in 2016. The most expensive home sold for 18,712,500 for a spectacular Mediterranean 4 bedroom, 6 full and 2 half bathroom estate with 10,476 Sqft of living space on 2.5 acres with panoramic views. The least expensive home sold for 930K for a 2 bedroom, 2 bathroom, 1,619 sqft home on a 5,245 SqFt lot, steps to Spyglass. In 2015, 19 homes sold escrow. The most expensive home sold for 7.45 million it was a 3.32 acre lot with spectacular views complete with a 1 bedroom, 1 bathroom, 796 SqFt guest house with plans for a 10,019 SqFt 2 story-house. The least expensive home sold for 1.125 million for a 3 bedroom, 2.5 bathroom, 2,398 SqFt home in the upper Pebble Beach estate area on a half acre. 30 homes closed escrow in this neighborhood in 2014. The most expensive home sold for 10.3 million and was a 7 bedroom, 7.5 bathroom estate with 5,446 SqFt of living space on a 3 acre lot with stunning Ocean and Pebble Beach views. The least expensive home sold for 760K for a 3 bedroom, 3 bathroom, 1,780 SqFt home on a corner lot of a cul-de-sac. In 2013, 22 homes sold in the neighborhood. The most expensive home sold in 2013 was a 6,934 SqFt home with panoramic ocean views, which sold for 7.45 million. The least expensive was a 2,100 SqFt ranch style home on 9,300 SqFt of land, which sold for $806,000. 25 homes sold in this neighborhood in 2012. The most expensive home that sold, sold for 7.178 million for a 5 bedroom, 4 full and 2 half bathroom, 7,358 SqFt Tuscan Masterpiece with Ocean Views. The least expensive home sold in 2012, sold for $575,000 and was a 1,407 SqFt single level home a mile from the ocean, near Spyglass Golf Course on a 9,400 SqFt lot. For a detailed analysis of Pebble Beach real estate sales, check out our monthly Community Market Reports. To live in Central Pebble Beach is to truly experience the Pebble Beach lifestyle. Your prime central location allows you to take advantage of all the amenities and wonders that attract visitors worldwide to this exceptional location. Golf enthusiasts will enjoy the seven renowned courses, cyclists and runners will be inspired by miles of ocean front trails. Hikers will enjoy the peaceful solitude of a morning hike through the trees. You are never far from a relaxed yet sophisticated meal at Pebble Beach Lodge or the Inn at Spanish Bay. You have a front row seat to all Pebble Beach events, from the AT&T Pro Am Golf Tournament every February rich in tradition from the days of Bing Crosby, or the Concours d’Elegance which showcases the rarest most awe inspiring cars in the world. Whether your home is situated in the forest or along one of the prestigious golf fairways, you live in a remarkable neighborhood, unique unto itself.